Visit the true African wilderness in the Ruaha National Park, Tanzania. Ruaha National Park in Tanzania is one of the most pristine game reserves and undoubtedly the ideal destination for the real safari tourists. The park has a rich wild life and consists of a fascinating mainly rocky landscape. Partly big savannas with occasional baobab trees and densely wooded hills with dense riverine forests along the rivers. Ruaha National Park is a large park with paths along the seasonal rivers where antelope species a chance car on the sparse water in the river, risking their lives and where the leopards and crocodiles lurk buried. Sand rivers are interspersed with large rocks where the daytime proest hippos are entertained and where elephants cool off in the river. Lions and cheetahs hunting on the vast savannahs of the impala and zebra herds. One area where large herds of African wild dogs hunting the small Kirk’s Dik Diks and skittish Koedoes pass through the bushes .. This park is an unprecedented unique safari destination for those who are especially looking for the real African bush in Tanzania. 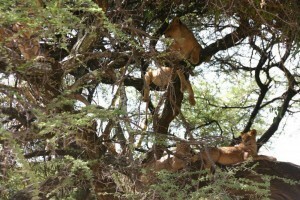 The special attraction of Ruaha, in addition to the spectacular scenery, the pristine wilderness. This park is relatively unknown and only recently developed for tourism and the remote destination less frequented by tourists. For active travelers the area to take walks in the bush accompanied by armed guides, to use a boat to explore the banks of the river or with a 4WD vehicle to explore the savannah. The park is part of a rich and varied large ecosystem include the adjacent game reserves Rungwa and Usango, with a total wilderness area of 10 300 km2, accessories. There is a transition zone where eastern and southern species of flora and fauna overlap. With 1650 different plant species and over 450 bird species makes this area attractive for birdwatching. To the north rises the Great Ruaha River which winds its way through deep gorges, passes into the Rufiji whereupon it feeds the sand rivers. The southwestern part of Ruaha National Park is by far the most visited and has a variety of lodges situated directly on the banks of rivers, located in a valley of the Ruaha Escarpment and the Great Ruaha River. In the dry season from June to December are the rivers dry and attracts an unrivaled amount of wildlife to this valley.